Newtown, Conn. – The Independent Carton Group is pleased to announce that Andy Willie, one of its founding members and executive director emeritus, has been presented with a Lifetime Achievement Award from the Flexo Label Advantage Group. 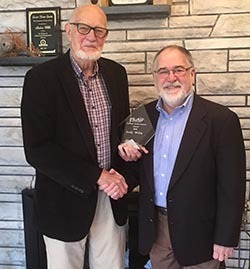 During FLAG’s recent annual meeting in Toledo, Ohio, Willie was recognized with the award for the support and guidance he provided to FLAG president and founder John McKay. McKay met Willie nearly two decades ago while serving as strategic development manager at Pitman Company, a graphic arts supplier, and Willie, then executive director of the ICG, was in the process of launching a group purchasing program. McKay was instrumental not only in establishing the relationship between the ICG and Pitman, but also in bringing Agfa Graphics to the table, as Pitman was an Agfa distributor at the time. Agfa and Pitman (later acquired by Agfa) were the ICG’s first suppliers, and Agfa Graphics remains the ICG’s oldest supplier today. Through the partnership, McKay helped create a financial benefit for ICG members, who are all independent folding carton converters, and for Pitman and Agfa, as ICG suppliers. In 2010, after 25 years in the printing industry and armed with valuable buying group experience, McKay set out to bring group purchasing benefits to independent flexo label converters. Though the ICG and FLAG serve different groups within the printing industry, they share a mission of helping their members become stronger and more competitive without sacrificing their independence. FLAG’s Lifetime Achievement Award was presented to Willie for his support of McKay’s efforts in forming FLAG, his positive affect and influence, and the insight he provided over the years. Willie’s career in the folding carton industry spans nearly six decades. In 1959, he joined Curtis Packaging in Sandy Hook, Connecticut, and spent 32 years there, including 10 years as co-owner and general manager. Curtis was one of the ICG’s five founding members, and Willie played key roles both in forming the ICG in 1982 and spearheading the group purchasing program in 1999.